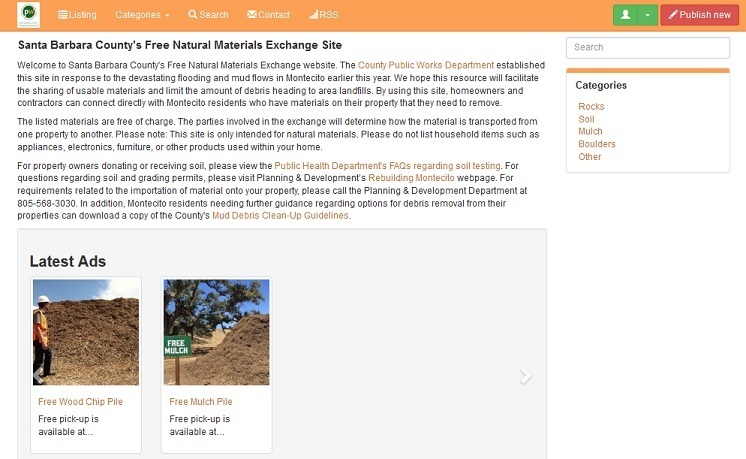 The County’s Resource Recovery & Waste Management Division established the new Materials Exchange Website in response to the devastating flooding and mud flows in Montecito earlier this year. We hope this resource will facilitate the sharing of usable materials and limit the amount of debris heading to area landfills. By using this site, homeowners and contractors can connect directly with Montecito residents who have materials on their property that they need to remove. The listed materials are free of charge, and the parties involved in the exchange will determine how the material is transported from one property to another. It’s important to note that this site is only intended for natural materials. Categories include boulders, mulch, rocks, soil, and “other.” Household items such as appliances, electronics, furniture, or other products used within the home, should not be listed. For property owners donating or receiving soil, please view the Public Health Department’s FAQs regarding soil testing. For questions regarding soil and grading permits, please visit Planning & Development’s Rebuilding Montecito webpage. For requirements related to the importation of material onto your property, please call the Planning & Development Department at 805-568-3030. In addition, Montecito residents needing further guidance regarding options for debris removal from their properties can download a copy of our Mud Debris Clean-Up Guidelines.